The term "Furnishings" refers to the long hair on the extremities of dogs including head and tail (ie, mustache, long eye brows, etc). A mutation responsible for "furnishings" or "satin" coat in dogs has recently been identified in the RSPO2 gene. Bernese Mountain Dogs are an unfurnished breed (IC) while the poodle is a furnished (F) breed. Incomplete Coat, or IC is another term for unfurnished. IC in no way negatively impacts the health of the dog. Furnishings (F) are a dominant trait, meaning that a dog only needs to have one copy of the Furnishings gene to show that physical trait. 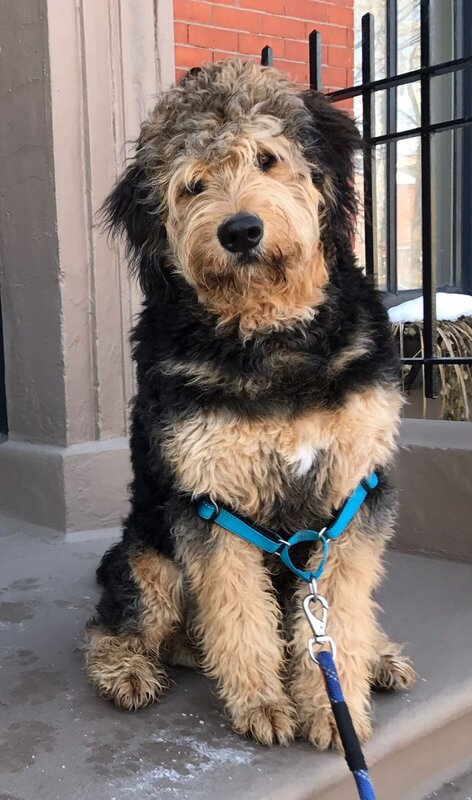 When a Bernese Mountain Dog (IC) is crossed with a poodle(F) the resulting dog is a F1 bernedoodle, 50% Bernese Mountain Dog and 50% poodle. All F1 bernedoodles are furnished as we can see from the chart below Bernese Mountain Dog (-/-) X Poodle (+/+) results in 100% of offspring with furnishings. However, when crossing multi generational bernedoodles, or back crossing with a poodle the genetics becomes more complicated. Dogs that are heterozygous (+/-) for the Furnishings gene can pass on either the Furnishings gene, or the Non-Furnishings gene to any offspring. If two dogs that are both heterozygous for Furnishings breed, there is a 25% chance that each offspring could get the non-Furnishings allele from each parent, and not display that trait. The bernedoodles included in our breeding program are genetically tested for the IC gene. We will inform you if there is a chance of a litter having some unfurnished pups prior to your puppy selection. Wish for more detailed information? Enjoy this read from the US National Library of Medicine National Institutes of Health.